How many shipwrecks are there in the world? This is a question that many wonder, and are shocked by when they hear the answer. Sub Sea Research’s database holds information on almost 150,000 shipwrecks, but that is only a small fraction of the amount out there. The United Nations estimates there to be around 3 million shipwrecks covering the ocean floor, though the exact number is obviously unknown. This number seems very high, but is altogether accurate. Why are there so many? There are many factors that can cause a ship to sink. In the early days of maritime, it was more common for shipwrecks to occur. On occasion, ships were overloaded with cargo. The weight of this would create flooding, which would in turn cause the entire ship to go down. Sometimes, the ships were built poorly. For instance, in 1628 the Swedish ship Wasa met its end because of poor design. The ship was too narrow with too small of a ballast tank, causing it to capsize. Even if the ship is constructed well, it is possible for the equipment onboard to malfunction and cause a sinking. Improper sails or rigging or faulty engines has led to the demise of many a ship. Fire is another frequent problem that causes ships to sink. Detonation of cargo or engine room fires can lead to a ship’s demise, as we learned in the story of the Royal Tar. Bad weather is one of the most common causes of shipwreck. There have not always been accurate 7 day weather forecasts, navigation systems and radar. Low visibility, wind, and high seas can all play a part in disaster. When a ship’s crew was unable to see what danger lies ahead, they would often sail unknowingly into hurricanes, monsoons or other deadly storms. That is not to say that sailors didn’t have their own ways of detecting bad weather. They used observation, mainly. There were many helpful adages to aid them on their travels. Some of these included ‘The higher the clouds the finer the weather’, ‘Ring around the moon, rain real soon’ and ‘Red sky at night, sailors delight. Red sky in the morning, sailors take warning’. Of course these adages, while occasionally useful, cannot always predict every nuance of bad weather. Similarly, one of the most frequent causes for shipwreck in the days before GPS and sonar was error in navigation. Sailors used techniques such as dead reckoning or celestial navigation. These worked well when crossing the ocean, but in places near land it was a different story. Reefs could not be detected using these systems, and many ships would collide with them or run aground. Warfare and piracy are two other prime causes of shipwreck, with guns, torpedoes, missiles, mines, bombs, and depth charges being the tools of the trade. Many ships, including Sub Sea Research’s current target, the SS Port Nicholson, are the casualties of war. So, these are the reasons why so many shipwrecks exist. Is there a spot that has more than others? The Atlantic Ocean is a big hotspot for shipwrecks, especially along the coasts lining the four continents that border it. The Caribbean is one we often think of. While it’s true that many ships perished in the Caribbean, particularly in what is known as the Golden Age of Piracy in the late 1600s and early 1700s, it is actually not the number one area. 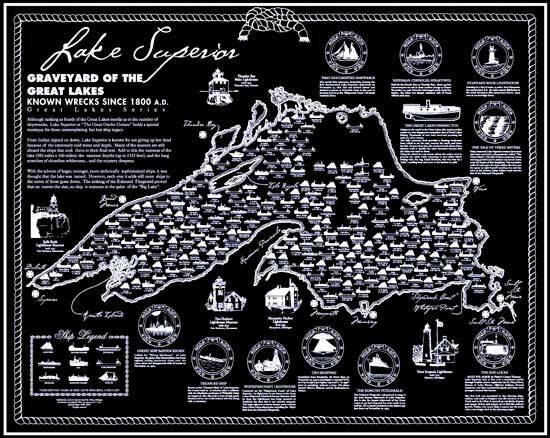 Lake Superior in Michigan, USA has the most shipwrecks, comparative to its size. If you were to combine all of the shipwrecks of the Great Lakes, they would have more shipwrecks than all of the other bodies of water in the world combined. The Caribbean may have claimed many wrecks in the Golden Age of Piracy, but the Great Lakes have continued to increase their numbers well into the 20th century. The Edmund Fitzgerald, a wreck immortalized in a Gordon Lightfoot song, went down in Lake Superior in November 1975. The USS Mesquite, the most recent sinking, ran aground in December 1989. This wreck is still preserved and is available for divers to explore. The subject of shipwrecks is a fascinating one with stories that seem almost endless. There are certainly less shipwrecks nowadays, but that doesn’t mean the future of marine life is shipwreck-free. Care must always be taken to ensure that accidents don’t happen. The ocean is a dangerous place, and can change from calm to ferocious in a matter of minutes. That doesn’t stop many from adventuring on her waters every day. Where there is an ocean, there will always be those who dare to explore. Very interesting and informative. I lived in Michigan, right near Lake Superior, for five years. Never knew there were that many wrecks there. Its true, you learn something new every day.